In the last post we discussed about how much water is essential for human body. In today's post, I am talking about coconut water. Coconut water is the natural and un-adulterated source of hydration. 1) You can vouch on coconut water for beauty and nutrition due to its high content of essential vitamins and minerals like calcium, dietary fiber, magnesium, zinc, potassium, etc. 2) It is favorite drink of weight watchers as it is cholesterol free liquid. 3) As compared to soda / energy drinks / cold drinks, it is better to consume coconut water as it is un-adulterated with artificial flavors. 4) Due to high in electrolytes, it is good for lungs and muscles. 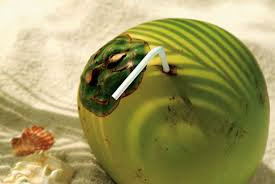 5) Regular drinking of coconut water helps in reducing problems like acne, ulcers, eczema, etc. 6) It has also proved to reduce the age related problems like stretch marks, wrinkles, age spots, etc. Coconut water can be consumed at any time during the day. Due to its cooling effects on the body, it is advised to avoid after the sunset. It is recommended by many experts to have it after lunch. Generally we buy coconut water from the roadside vendors. Vendor's cut the upper part of coconut and put the straw and give you to drink. Have you thought anytime of the hygine part of the straw. How much dust has been there on that straw. I usually carry straw in my bag and I use my straw to drink coconut water. Times when I am near home / office, I get the coconut to home / office and pour it in the glass and enjoy it. Do have it as soon as you cut open the coconut to avoid the loss of nutrients due to its exposure to air and environment. 1) Is it good for diabetic patient or not: Well, generally speaking, main problem of diabetic patient is less circulation of blood in their body. Coconut water helps in proper blood circulation, thereby can be prove beneficial to diabetic patients as well. 2) Is it good for pregnant ladies: Coconut water has wide nutritional benefits for pregnant ladies because of it's content of electrolytes, essential minerals and vitamins. 3) Can elderly people have coconut water: Yes, this wonderful drink can be enjoyed by all age group of people. However it is important to remember moderation is the key. Secondly, follow what your doctor has advised you, as they have studies your case and know better. Do let us know do you drink coconut water on regular basis.